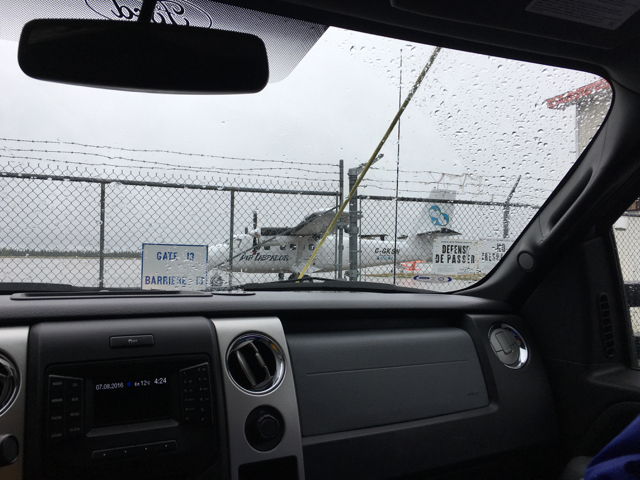 We’re in Labrador! 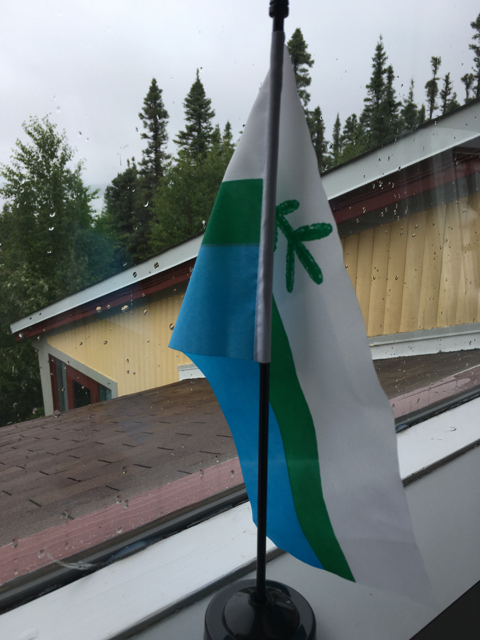 We’d hoped to fly out today, one day early, but the weather gods did not shine upon that prospect so we explored Goose Bay, Happy Valley, and North West River. Our plan is to fly into Saglek airstrip, hopefully take a boat to Hebron Fiord, paddle to Grimmington Island, climb the Bishop’s Mitre and Brave Mountain, not get eaten by polar bears, and then paddle back to Saglek for our return flight to Goose Bay. 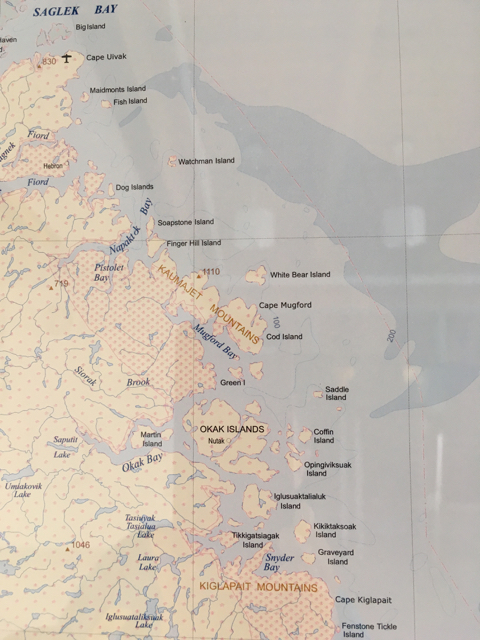 As you can see on the map above, the Bishop’s Mitre and Brave Mountain are in the Kaumajet Mountains, a wonderful pocket range on the coast of Northern Labrador. You’ll also notice the likely aptly named White Bear Island. We hope none of the white bears are home. Grommington is the island to the east of Cod Island. Of course, all plans are subject to change. Like ours. No flights to Saglek or the coastal communities today…or yesterday…or perhaps tomorrow. It’s a waiting, hard telling, not knowing kind of life situation…like much of life really. It reminds me of one of my favourite Buddhist Lojong slogans, “Whichever of the two occurs, be patient.” Which we are…being patient…at least through day one of waiting. We took some of our waiting time in North West River. What a treat! North West River has been a hub of activity in central Labrador for eons. 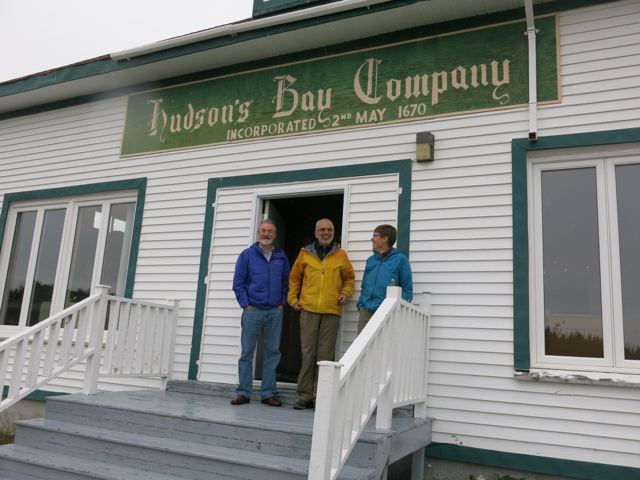 It was a trading post that became the site of a Hudson’s Bay Trading post starting in 1743. I know it best as the starting point for the two Hubbard expeditions, one led by Leonidas (that didn’t turn out so well for him) and one by Mina (which turned out much better). We’re hoping our Paddle2Peaks expedition is more Mina than Leonidas. 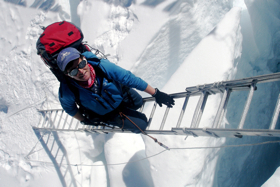 Mina is one of my heroes and I look forward to retracing her route to the George River. Some may remember we were days after from a George River Expedition in the summer of 2012 when I got hurt chasing my nephew around the pool. My paddling mates have forever banned me from a) chasing my nephew and b) going near backyard pools within six weeks of any future expedition. I loved seeing artifacts from both Hubbard expeditions at the Labrador Heritage Museum, located in the 1923 Hudson’s Bay Building in North West River. Standing where Mina stood, I made a commitment to make an expedition a George River expedition a reality in the new few years. The museum has a room filled with small models that are a delight to interact with as well as the main room which still resembles a Hudson’s Bay store. 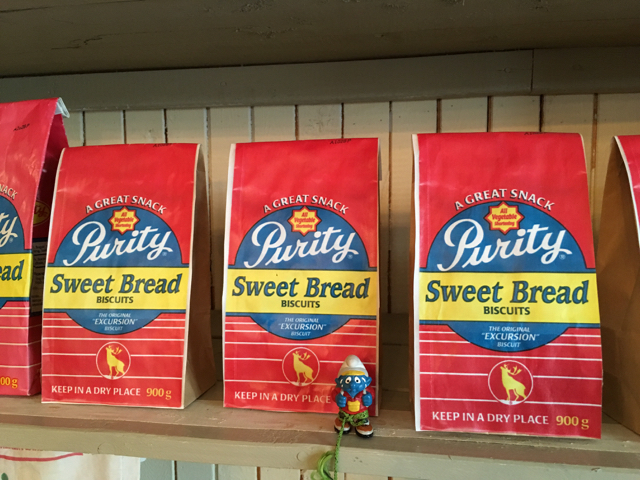 Climber Smurf checked out the Purity Sweet Bread packages on the shelf and decided that he matches the packaging quite well! We also stopped for a visit to the Labrador Interpretation Centre. There I saw a picture of another woman whose life story has moved me. 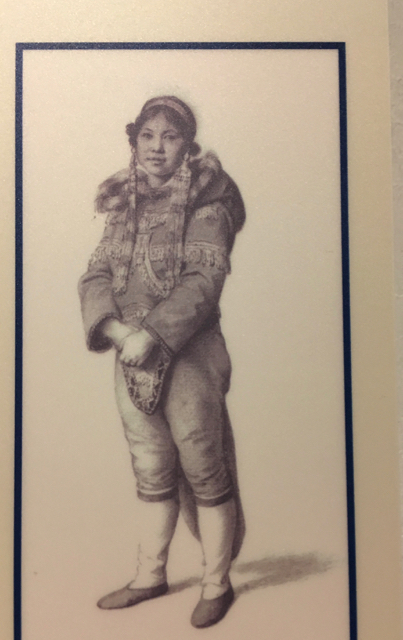 Caubvick, along with other Inuit folks, were taken by George Cartwright to England. 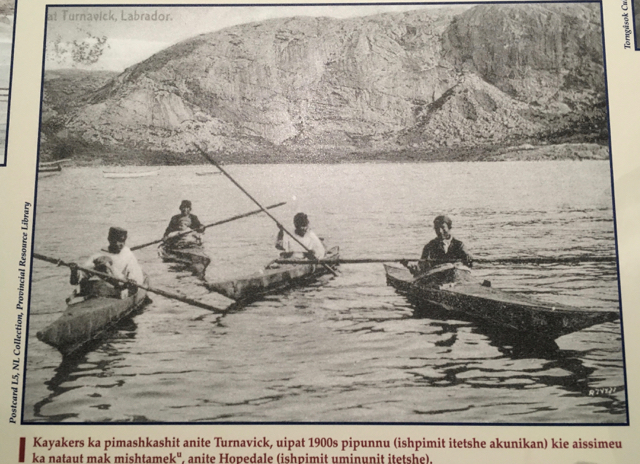 All of the Inuit contracted small pox except Caubvick. Caubvick returned to Labrador. Newfoundland and Labrador’s highest peak is named for Caubvick. I’m not sure but I don’t think there are many mountains named after women. The only other one I can think of is Mount Edith Cavell. 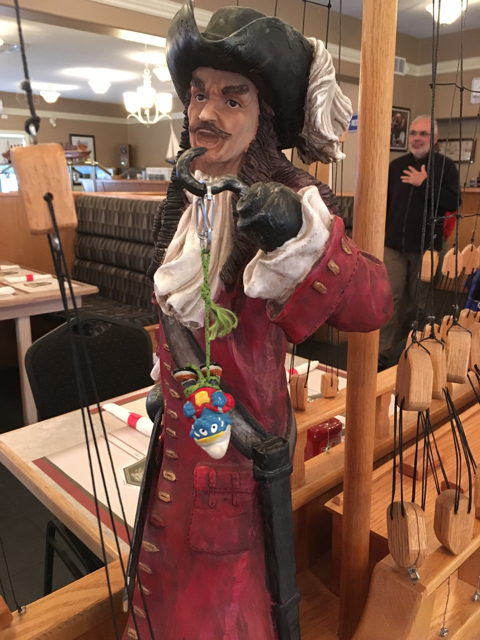 After all that exploring, we worked up quite an appetite and Climber Smurf got into a wee bit of pirate trouble at the Mariner Restaurant. He’s had a good day exploring and he’s eager to go North, way north…to 58 degrees north. 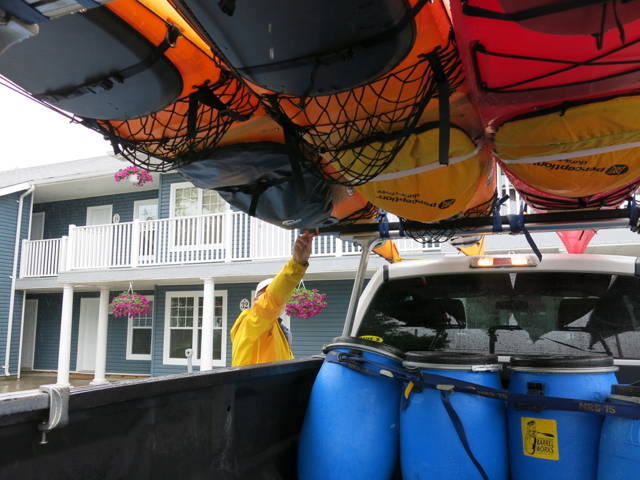 We’re eager to get our kayaks down from Mark’s truck and into an airplane. We’ll call Air Labrador dispatch at 6 am to get a weather and loading update. Hopefully the next update you get from us will be via sat phone from Saglek. I won’t be sending pictures from the trip-only audio and map updates so I’ll do my best to describe what we are seeing and experiencing and post lots of pics when we get back. May the ‘gods’ be with you tomorrow. Thanks. I’m hoping to be eating your tea buns on the plane tomorrow morning. Hello TA, I’ve not been following you for awhile but now see you are on a great adventure in Labrador! Good luck! Hope you are indeed flying “as we speak”. I read of Hubbard a good while ago and it made quite an impression on me. As for his wife, I think I only recall she set off in a dress! Thank you for mentioning Caubvick-I had not known about her. Your reference to White Bear Island reminds me of a partridge hunting trip I did once where I ventured on to Bear Hills, innocently thinking I was traipsing over Bare Hills. I look forward to further posts and pictures. All the best!